Amidst applause and high spirited cheering, the People's United Party (PUP) Belize Rural South slate for the upcoming Town Council Elections was endorsed and formally sworn in by the National PUP Chairman, Mr Henry Charles Usher. The endorsement convention of the PUP 7 took place on Thursday evening and was well attended by hundreds of residents from this municipality. 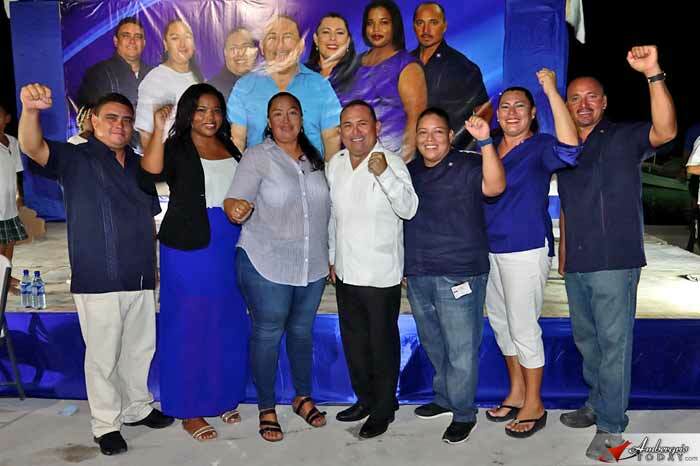 The PUP slate is led by mayoral candidate Andre Perez and is supported by Ian Pou, Ruben Navidad, Marina Graniel Kay, Johnnia Duarte, Ondina Graniel and Dianeli Aranda. Mayoral candidate Andre Perez promised to bring visionary progress and hard work coupled with accountability and transparency. Highlighted was the fact that the slate of seven consists of four females candidates, a historic and notable accomplishment. Perez stated that he accepts it will be a challenging job because he knows that the present UDP Council is broke and indebted, but he is certain that with his business knowledge and skills he can bring positive change and betterment for everyone in San Pedro.